Join us for our second performance of live radio theatre, complete with audience participation! Chris and Linda Tatarian (of Rum River Blend) host a 2-hour radio vaudeville show. Mosaic Radio Theatre LIVE! It's vaudeville...for your mind! Join us for our second performance of live radio theatre, complete with audience participation! Chris and Linda Tatarian (of Rum River Blend) host a 2-hour radio vaudeville show featuring a mosaic of drama, mystery, acoustic music, comedy, on-the-spot interviews, commercial jingles, and yes...sound effects! Performances by: John DeBoer, Kat King, Isaac Lucas, Michael Patrick, Bill Purk, MaryBeth Robertson, and Chris Tartarian. Also featured is Episode 2 of the original serial radio drama, Suicide for a Kiss, by Robert Thimmes. Any unsold tickets will be released to the Box Office at 1PM on the day of the show. 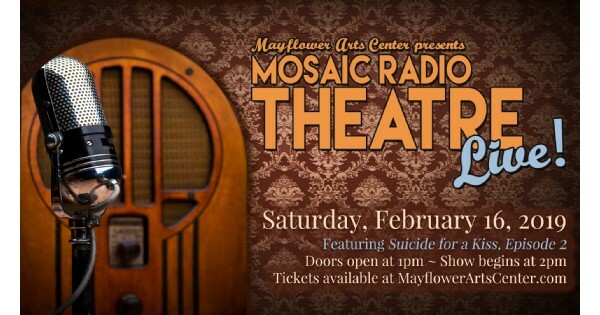 Find more events like "Mayflower Arts Center presents: Mosaic Radio Theatre Live"